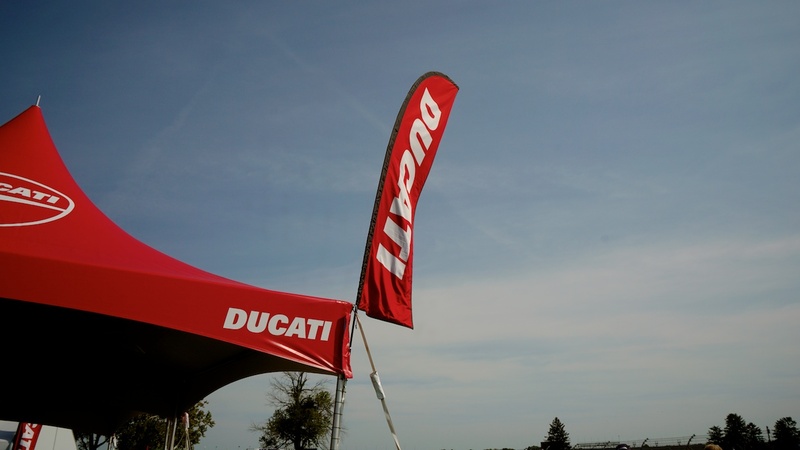 Fast Times with Ducati at MotoGP Indianapolis 2015. Part one. 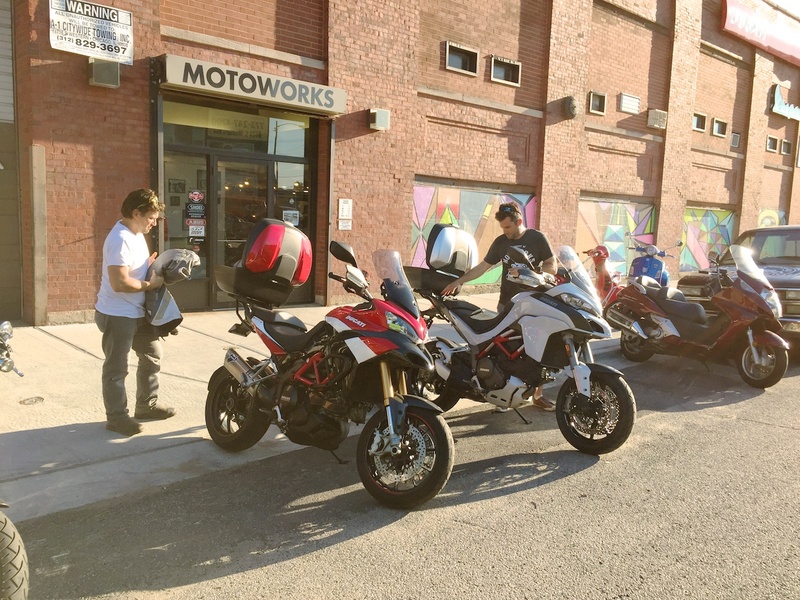 The sun was getting low in the afternoon sky as I pulled up to Motoworks Chicago to collect our Ducati Scrambler demo for the weekend. 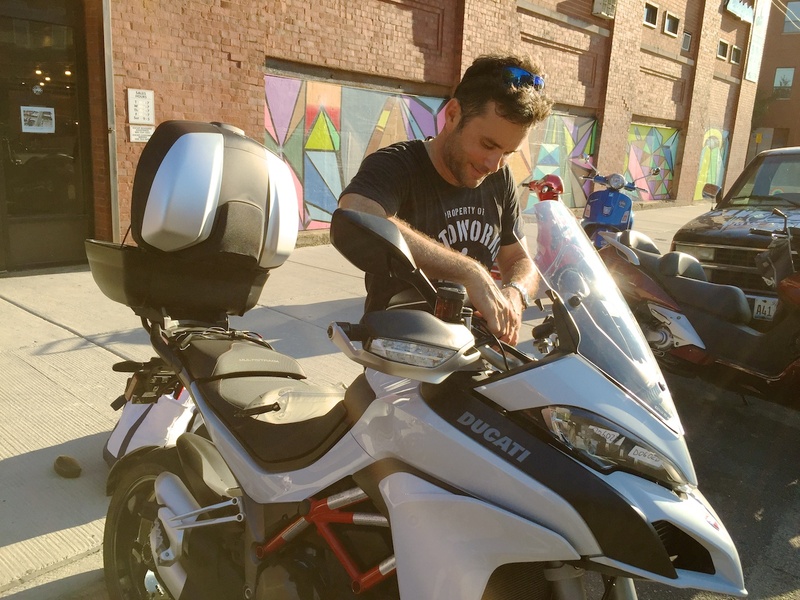 Johnny and Josh “Little Buddy” Saxe were already loading up a pair of Ducati Multistrada 1200s. “I thought you guys were headed down tomorrow morning.” I asked Johnny. 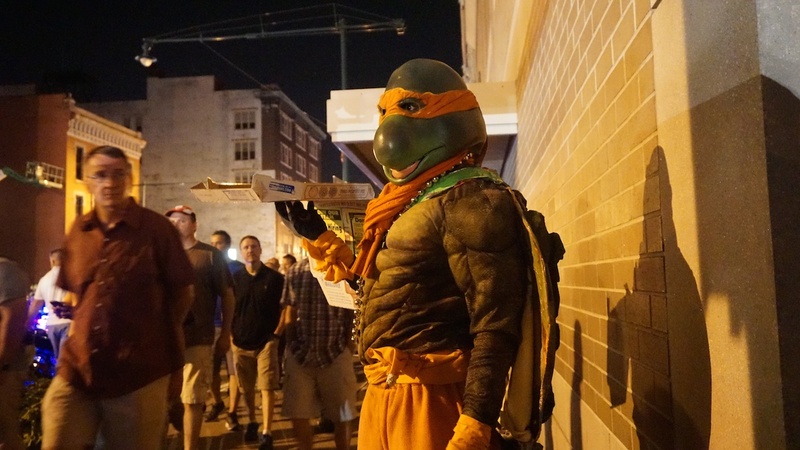 “Nope, we’re just going to blast down tonight and try to beat the rush.” he replied. I was jealous. 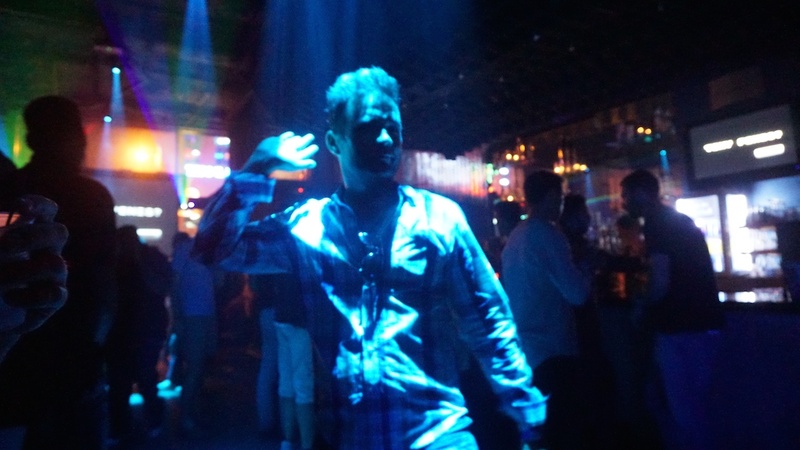 It was Thursday night and I wouldn’t be able to escape the office or Chicago for another 24 hours or so. 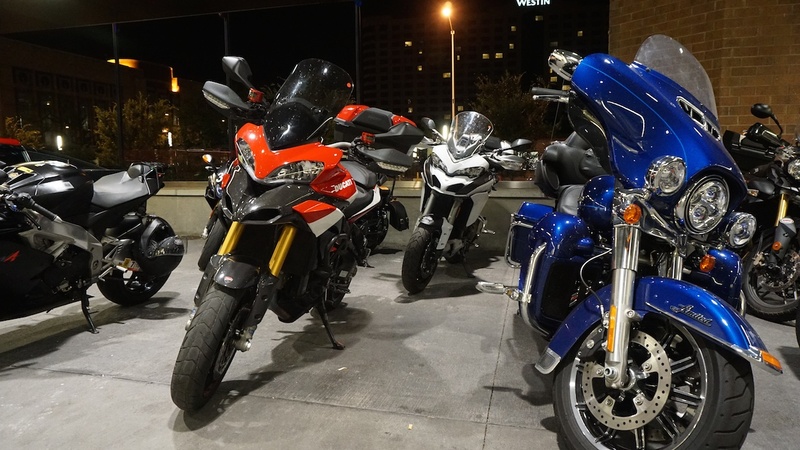 Even though we were leaving in a stagger, our three Ducati motorcycles weren’t picked at random. 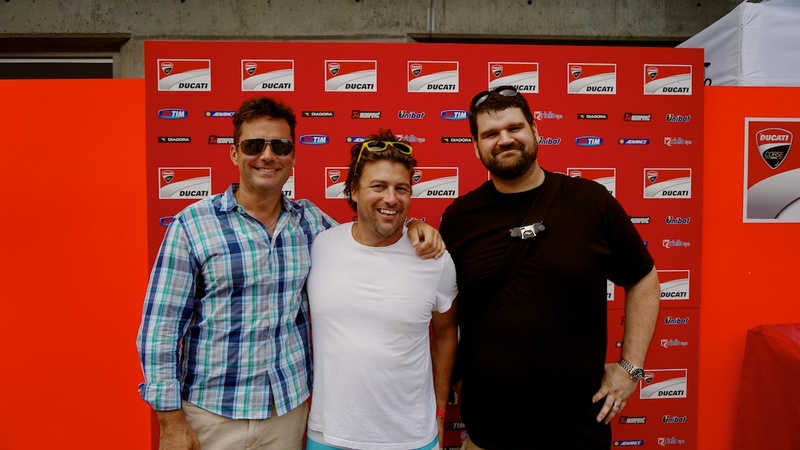 You see, it was MotoGP weekend in Indianapolis, and we’d been invited by our partners at Ducati to come and enjoy the race weekend with them at the track. 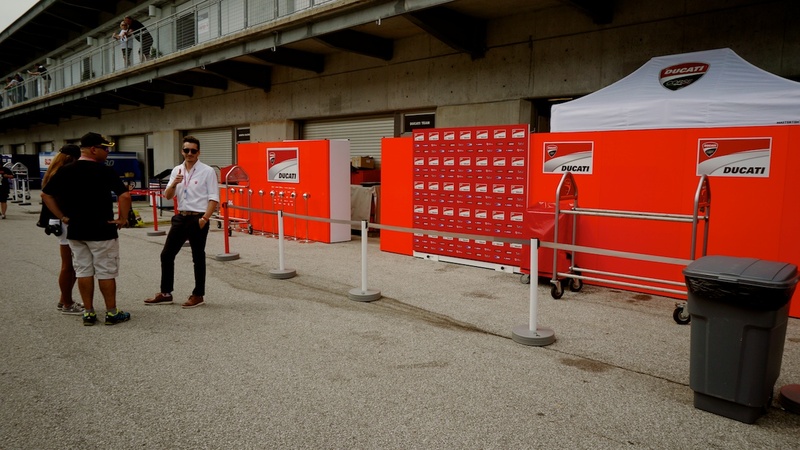 MotoGP weekend in Indy is worth going to regardless, but knowing that Ducati was going to take us quite literally behind the scenes at this world class event made it a can’t miss. We had a general idea of what was in store, but not the whole picture. All the better though. This was racing after all. If you knew the outcome, what fun would it be? Friday evening came and I was finally free of my Chicago-bound responsibilities. 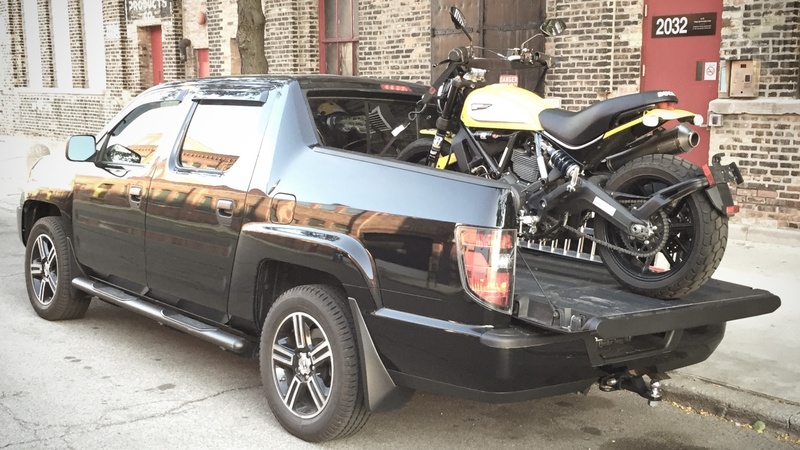 With a truck bed full of Scrambler, I hit the freeway bound for Indy. 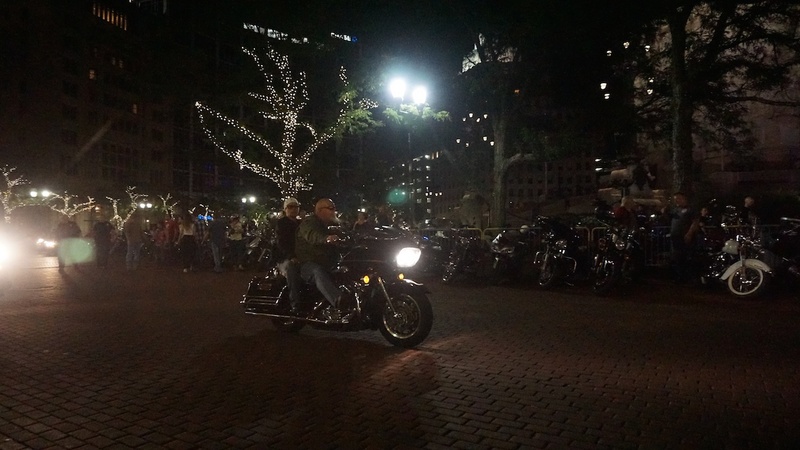 Not quite three hours later, I rolled into the heart of downtown Indianapolis and the party was already in full swing. 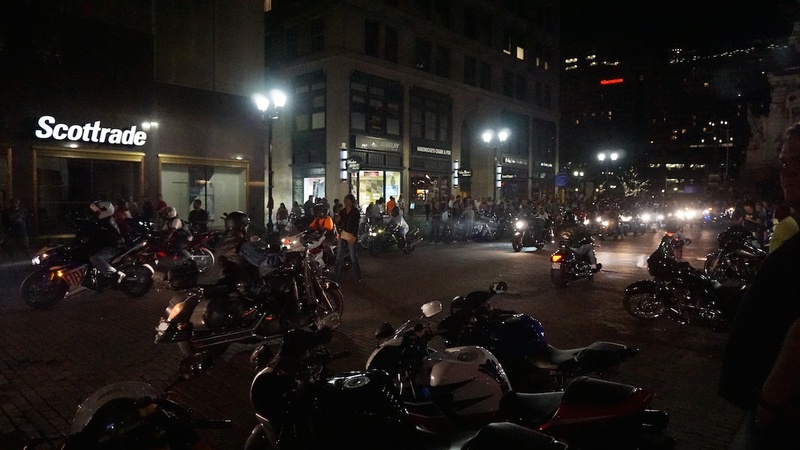 Up and down Meridian St. rode hundreds of motorcycles, while thousands more sat parked along the perimeter leading up to The Soldiers and Sailors Monument with its circle drive. 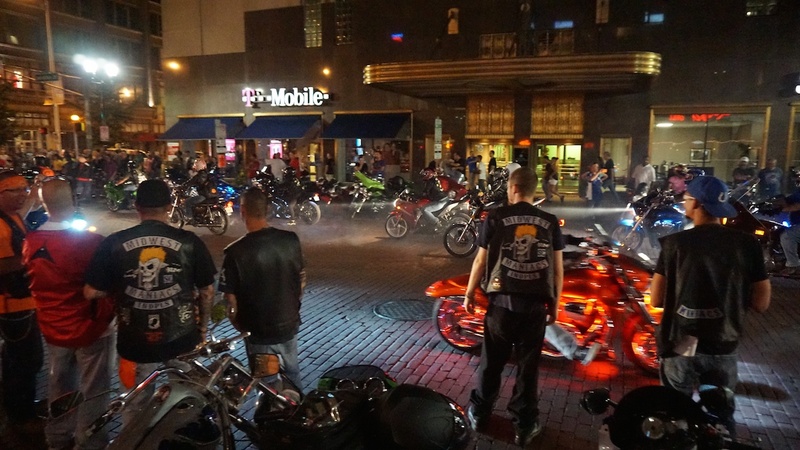 The rolling thunder of revving Harleys echoed between the downtown buildings while equally enthusiastic sport bike riders bounced their throttles off their rev limiters in a screaming chatter of ear-splitting racket. It was the glorious nightmare of every square hall monitor type in the tri-state area. 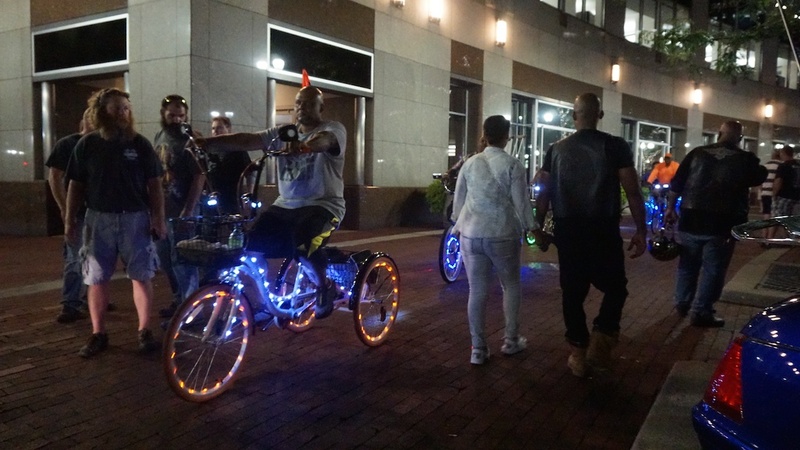 The sidewalks were swollen with bike fans and the party was booming, literally. 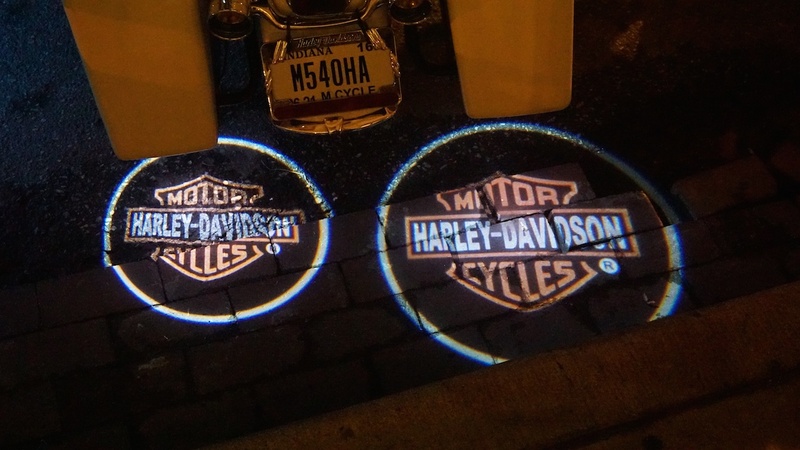 Biker heaven? Yeah, pretty much. 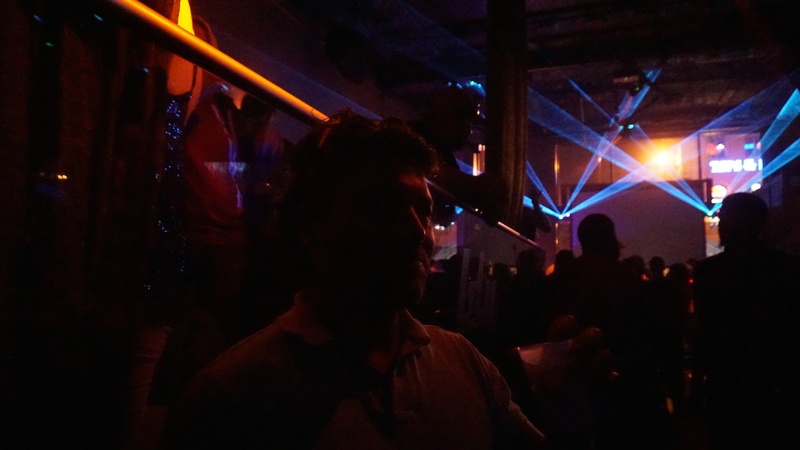 I caught up with Johnny and Josh at one of the local clubs, where we met up with old friends and made new ones. 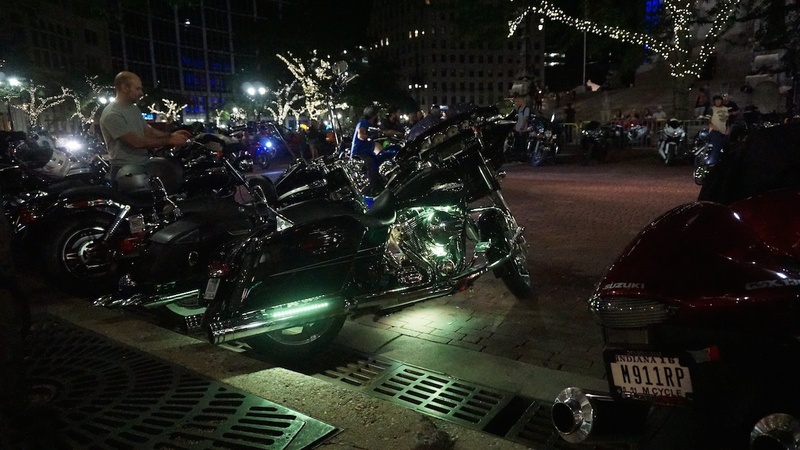 It was a mix of motorcycle industry folks and civilians alike, all of which were there to party down because it was race weekend. I quickly got the sense that I’d been missing out all these years. 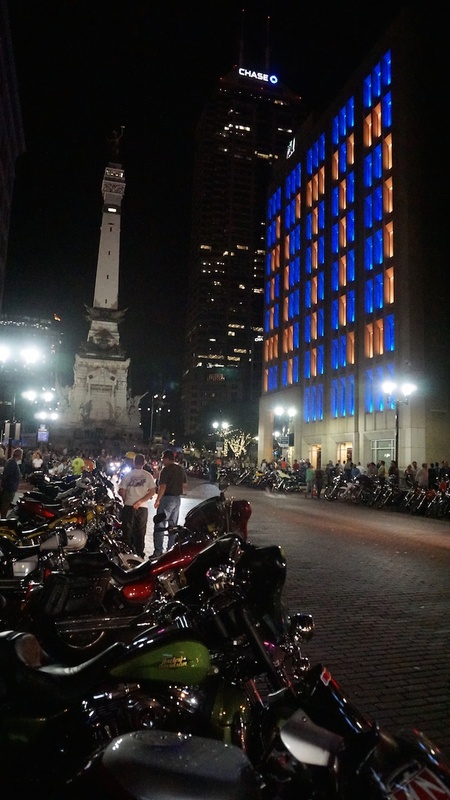 For all the time I’ve lived in the midwest, I’ve simply never made it down to Indy for MotoGP weekend. Now I understood what I was missing. 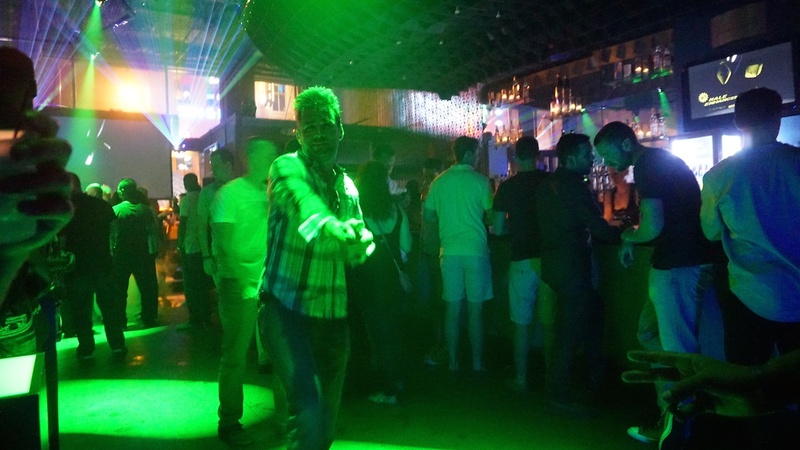 From the in-prompt-to biker rally happening on the street, to the food and beverage scene happening on and off the dance floor, it was good times all around. Saturday morning came early. Or rather, we continued Saturday morning where we’d left off a few hours earlier. 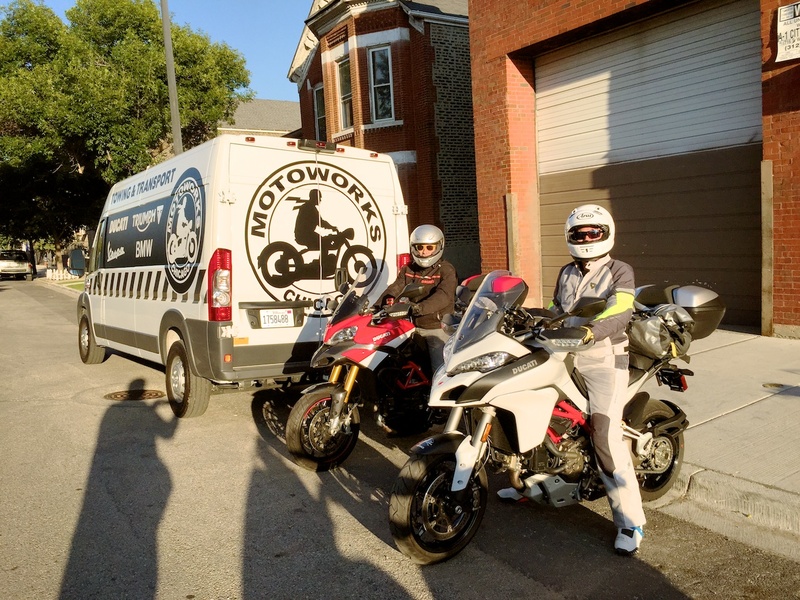 Fortified with coffee and as pre-hydrated as we could manage, the three of us set off on our Ducati motorcycles to check in on the track scene over at the Indianapolis Motor Speedway. 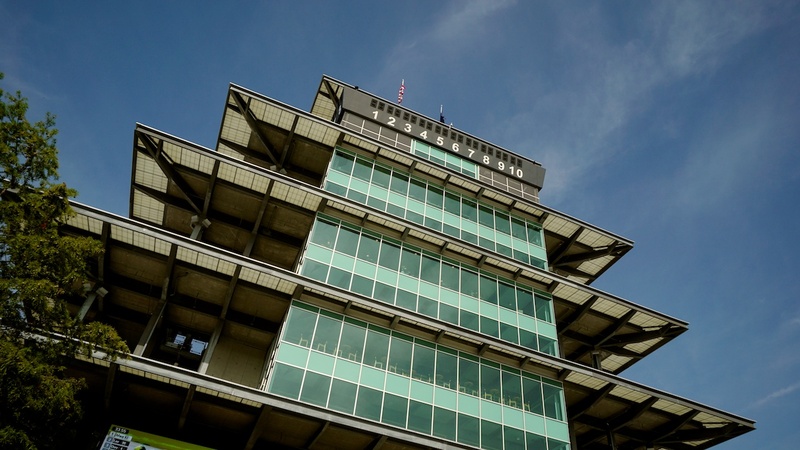 I’ve personally never been to The Brickyard, but I was excited to go. As we got closer, and the scale of the facility started to make itself known, I couldn’t help but feel a twinge of childish excitement. This was it — this iconic racetrack where every year they run what was for me, growing up anyway, the Superbowl of motor sports. We weren’t there to watch the Indy cars run though. 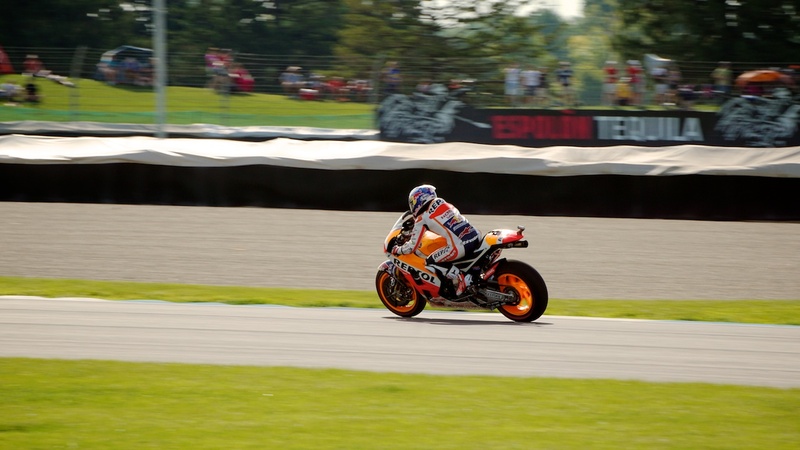 We were there for MotoGP and all the fan-side festival action that came with it. 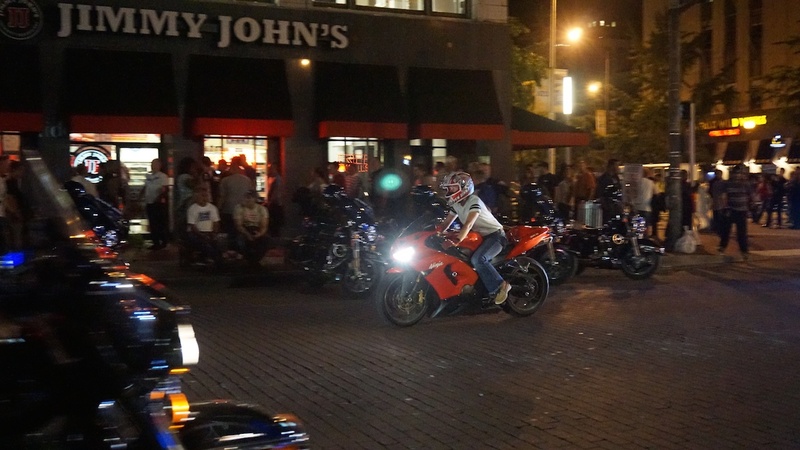 In particular, we were there to experience the event from a Ducati fan’s point of view. 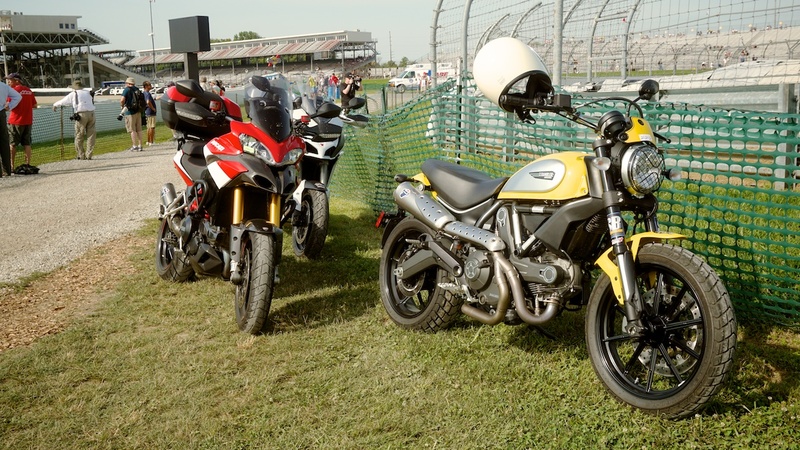 Here we were on three great Ducati machines, and those were enough to get us (or anyone else on a Ducati) special, Ducati-sponsored parking and the welcome treatment over at Ducati’s booth area on the track infield. 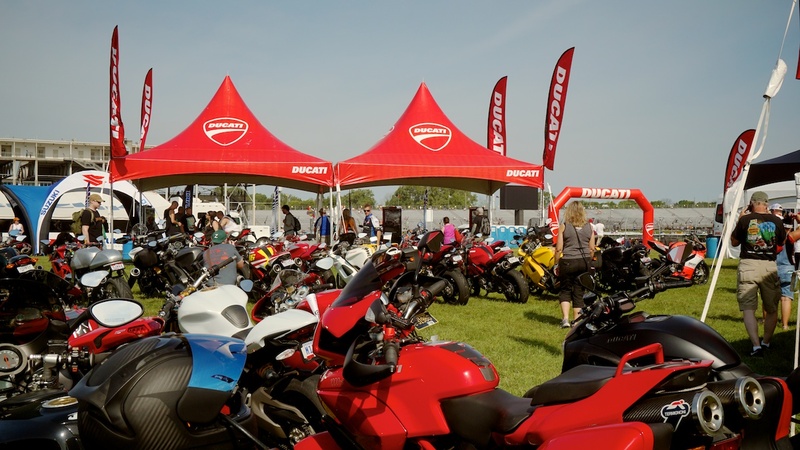 Dubbed “Ducati Island”, anyone riding a Ducati could park in the area, and if you had the Ducati grandstand ticket, you could also check your gear and there was exclusive swag. 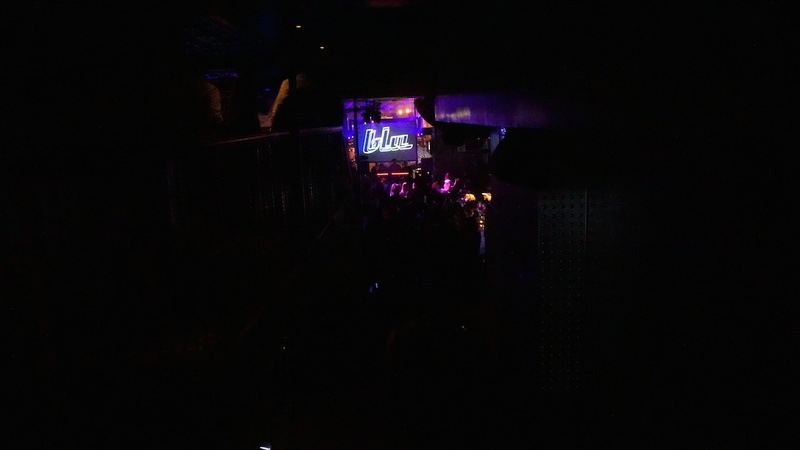 The sum total of this experience was pretty much rock star treatment. 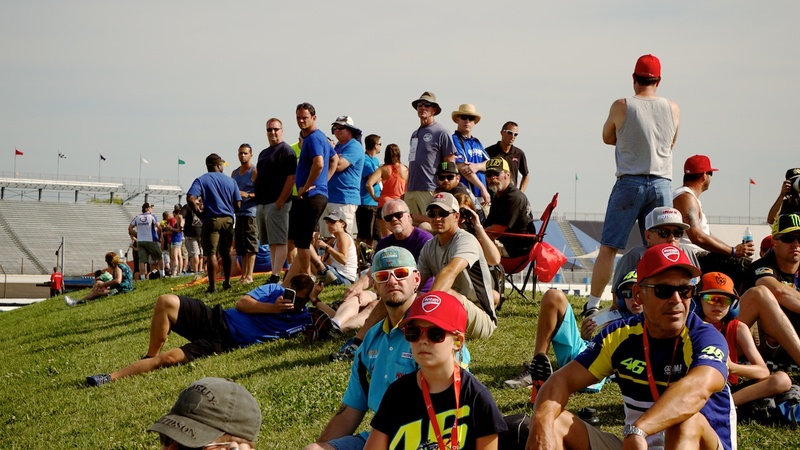 You had safe, secure parking right in the middle of the action, you had a grandstand seat overlooking the track, and you got to hang with the other Ducati fans who there there to cheer on the factory team riders. If you get the chance to take advantage of this very VIP-style track-side experience, we can’t recommend it enough. 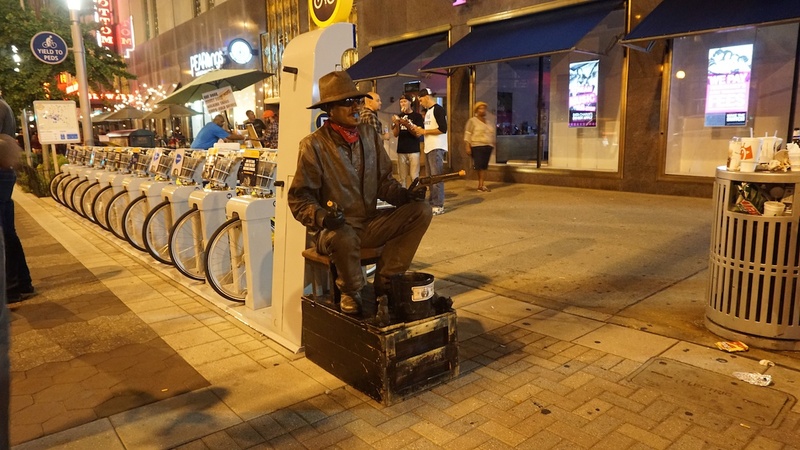 It’s all the more reason to hop down to Indy for the weekend. 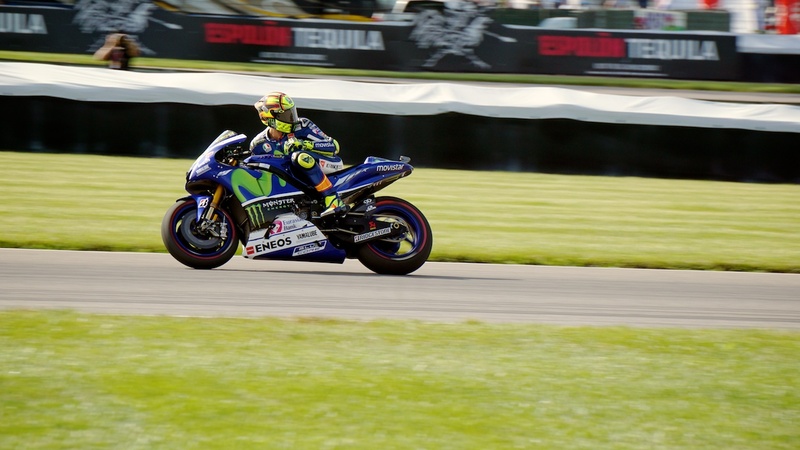 Saturday did involve some racing in the ancillary classes, as well as qualifying for Moto2, Moto3 and MotoGP. 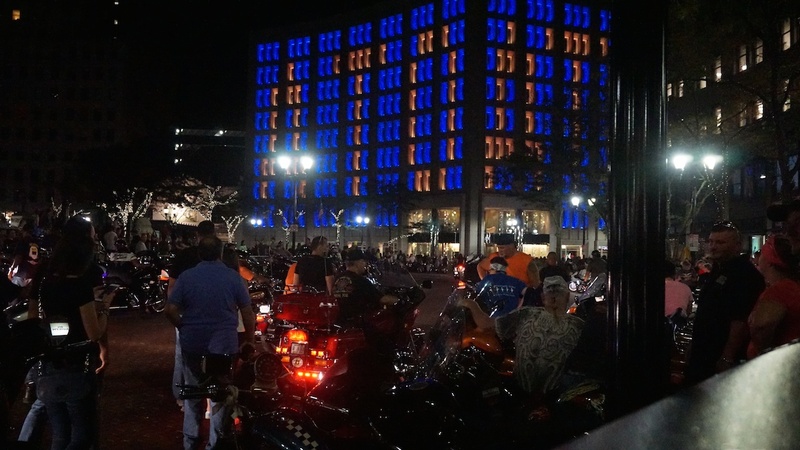 We’d catch the occasional bit of track-side action as bikes whizzed by in blurry streaks of racing fury, but one of the great things about the Indy venue is the plethora of massive jumbotron-style TV screens located throughout the facility. So we could be standing outside the iconic Pagoda, not able to see the actual track at all, but still see the action in real time on the huge screens. It was the best of both worlds really. We’d hear and/or see the racing action go by on the track live and in person — getting that sense of power, speed and excitement as it went — but we could also see what the TV audience was seeing too. There was telemetry, onboard camera views, instant replays and commentary just like you’d see on the broadcast. Yet there we were, right in the heart of the action. After tromping all over the facility, we found ourselves waiting by the Pagoda with a particular mission in mind. 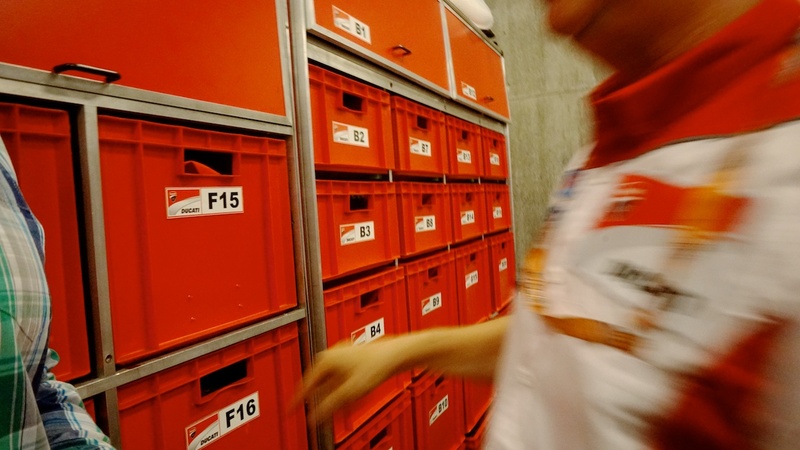 We’d been offered an exclusive look inside the Ducati MotoGP factory team garage. I enjoy tinkering with bikes almost more than I enjoy riding them, so this was a particular treat. I couldn’t wait to see how the pros set up their workspace. 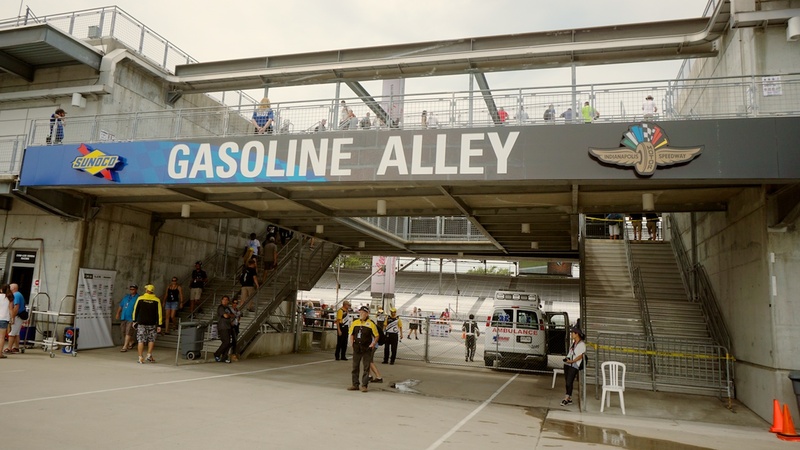 Our behind-the-scenes experience began in Gasoline Alley, which is home to all the MotoGP team garages. We arrived just in time to see Ducati MotoGP pilot Andrea Dovizioso arrive via scooter, stop to sign a couple fan pieces, and then dash inside the garage to take care of pre-race business. The atmosphere was that of a relaxed excitement. I know that sounds contradictory, but there’s no other way to describe it. Everybody was chill and professional, but there was also this palpable sense that even for those folks for whom this was their job week in and week out, they were still excited to be there. The enthusiasm from fans and pros alike was infections. The tour itself started with a quick dash through what was actually the rear door of the Ducati team pit. Inside we found a maze of partitions and short hallways that separated the garage’s various functions. The first piece we saw on our tour was the parts and spares inventory. This library of highly specialized motorcycle parts consisted of giant flight cases (imagine airline drink carts the size of extra large refrigerators) with numbered bins and drawers in them. At the end of the row sat a Ducati technician whose soul job, our tour guide informed us, is to inventory and keep track of all the parts, spares and pieces that go on and come off the race bikes. The level of organization was incredible, and this wasn’t just oil filters and valve stems. Our tour guide opened up one drawer to find several full sets of bespoke, custom-machined triple tree clamps. Each one was seated in a laser-cut, padded, foam slot like a piece of fragile electronics equipment. Our guide pulled one out, showing us the part itself, which was machined to within a hair’s breadth of failure it had so much material removed. There were no off-the-shelf parts here. Leaving the parts library, we were ushered around a narrow, temporary hallway to another alcove in the Ducati garage. 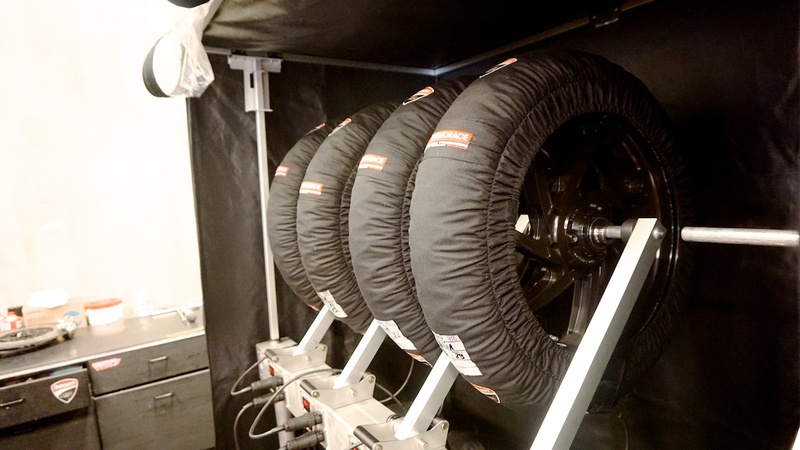 This housed the tire rack, where several sets of tires mounted on race wheels each had their own individual tire warmers. The whole setup was temperature monitored so that any tire selected to go on an actual race bike was at optimal temperature. While we looked on, one of the team mechanics checked the tire pressure on one of the rears using a precision gauge, no doubt dialing in the PSI to the track conditions and the pilot’s preference. At this point, they instructed us to go all the way to the back, and our guide asked me to stop taking photos. I obliged as we reached the end of the little garage maze. Here we weren’t quite in the garage itself, but in a little observation nook off to one side. In front of us sat four Ducati MotoGP bikes, each on its own work stand. The work areas were divided up into two sections, each a mirror image of each other. Our guide gave us the run down. As we looked on, the mechanics were hard at work on the bike nearest us removing various body panels, tweaking components, and replacing those panels back. The bike farthest away from us at the other end of the garage was having its entire front suspension removed. I couldn’t help but wonder if they needed one of those triple tree clamps. 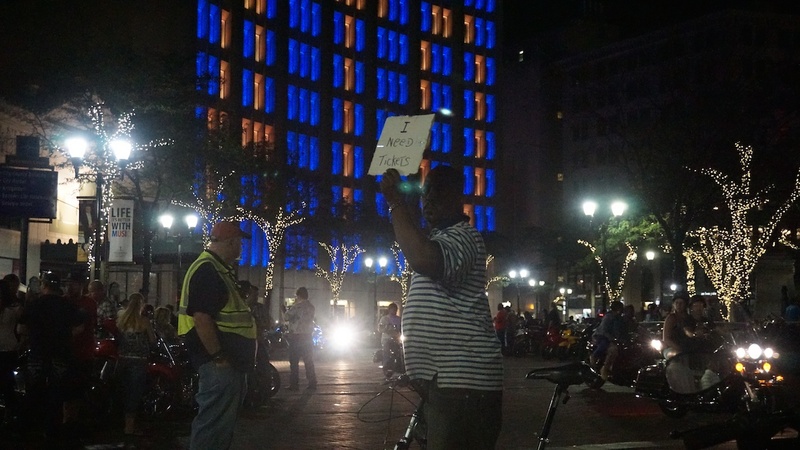 Perhaps I could volunteer to show them where it was. What struck me most about seeing these bikes up close was the sense of both precision and specialization. 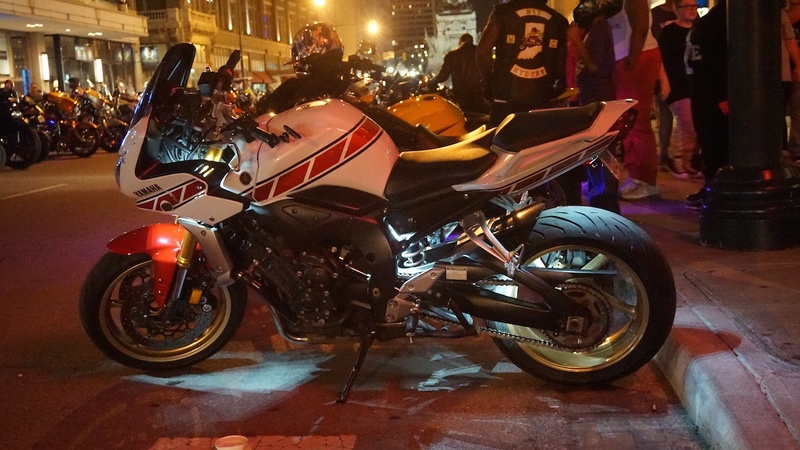 We got to see several bikes in various levels of disassembly and honestly, short of big stuff like wheels and suspension components, it was tough to tell what anything was. There were tubes and hoses and fittings and what looked like a dozen different wiring harnesses. 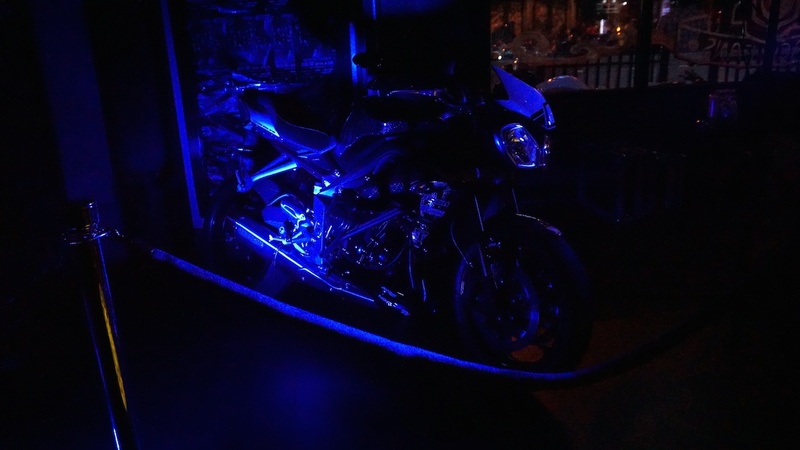 The exhaust systems seemed to route through impossible paths and underneath it all somewhere was an engine built to a ridiculous level of rigor. 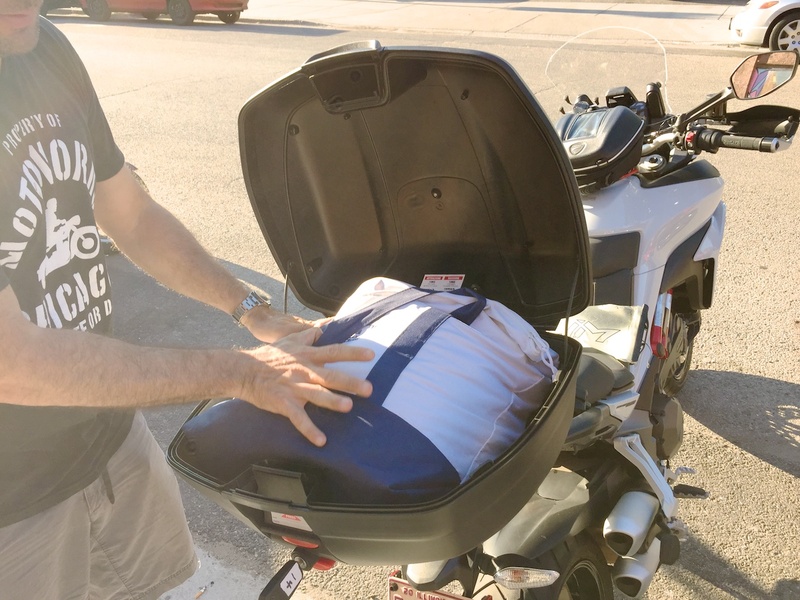 It gave me an instant appreciation for all the things that go into a production motorcycle — all those little things you have to do — those little compromises that get made on a bike when you’re making several hundred thousand of the same thing. 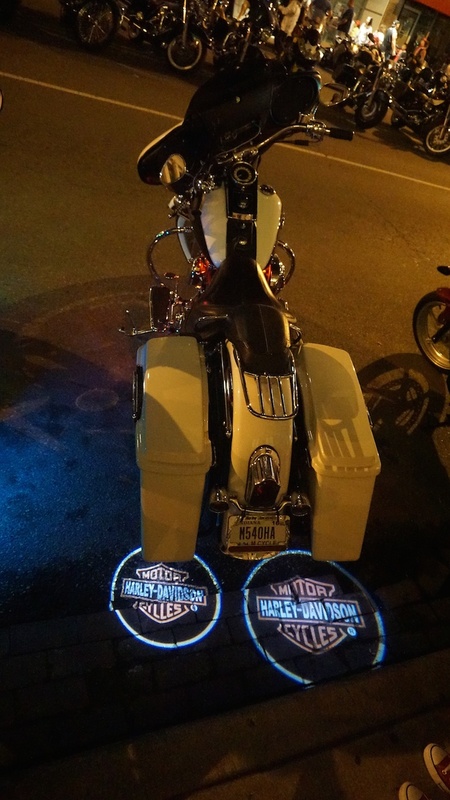 Here we were seeing four of four, and it was obvious that every single piece, fitting, line and component was purposefully placed, if not custom manufactured for that bike and perhaps that bike alone. It’s tough to describe what that looks like, but what it reminded me of the most was seeing behind the scenes at NASA. 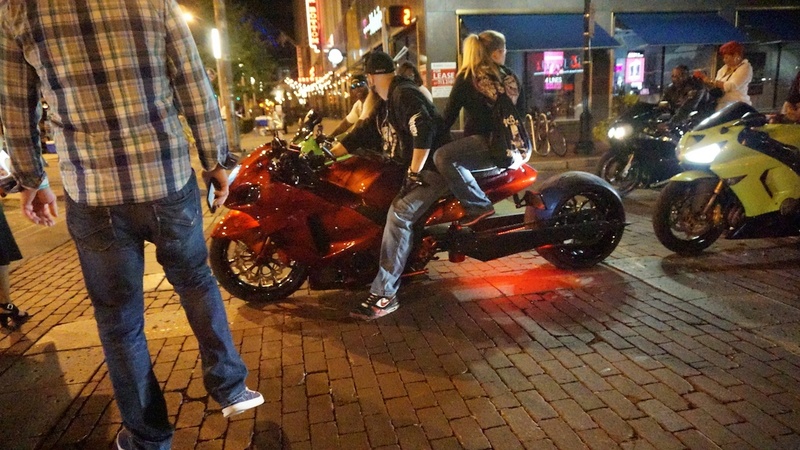 Under all the carbon fiber bodywork, these motorcycles seemed part spacecraft. 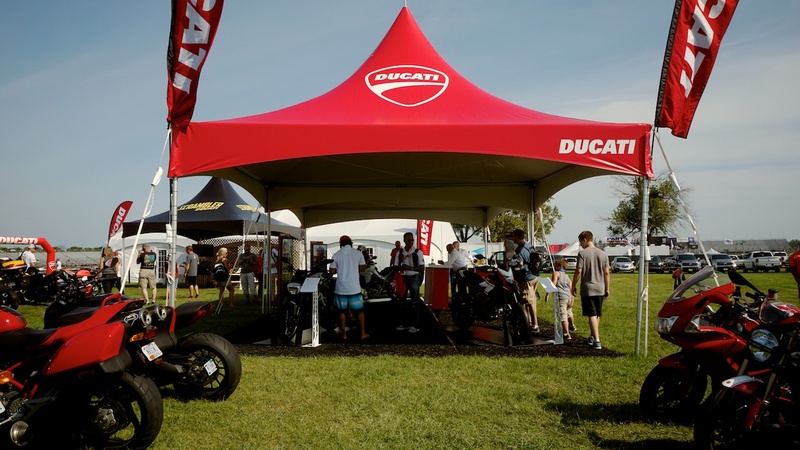 Yet just as impressive was this mobile garage and staging center Ducati had set up in the paddock there at Indianapolis Motor Speedway. This facility would have been impressive as a permanent fixture. Knowing that by the end of the next day the whole thing would be packed up and moved out to the next racing venue made the whole setup that much more impressive. Every last inch of that garage was planned and perfectly executed. 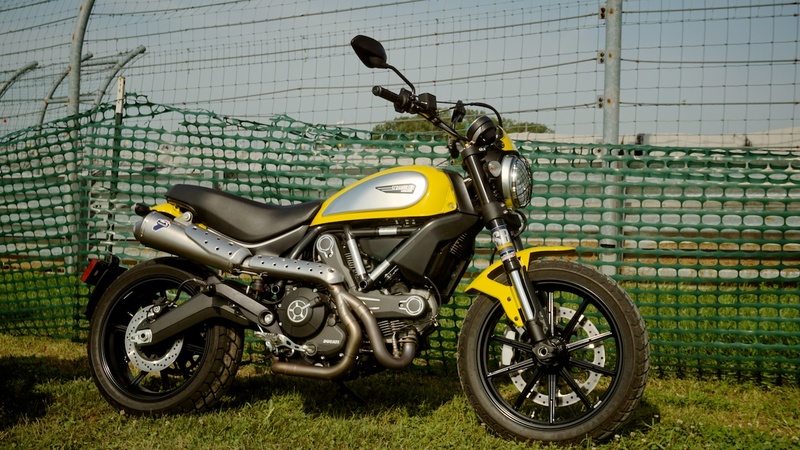 Race times aside, just fielding the Ducati racing effort is impressive all on its own. We shuffled back out into the July heat. 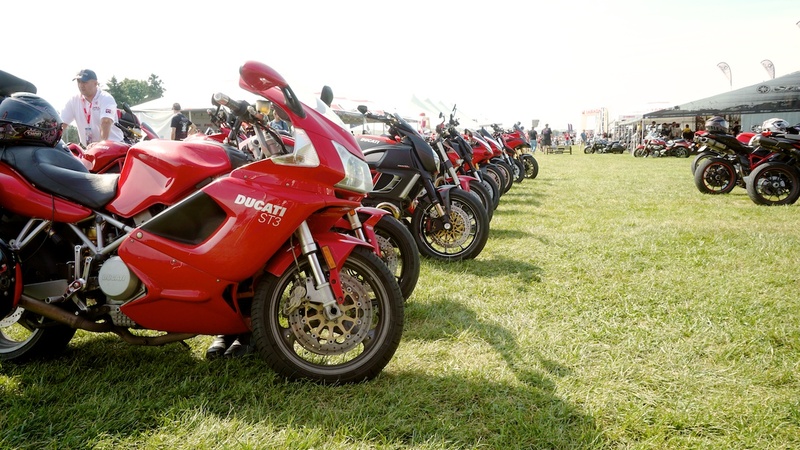 We’d certainly had the full Ducati experience so far. From Ducati Island on the far end of the infield, we’d made our way into Gasoline Alley and seen the inner workings of the Ducati race team. We really couldn’t have asked for more. Well, I would have loved to take more photos inside the garage. A photo in front of the sponsor board would have to do. With our tour done and the trackside scene beheld, we called it an afternoon. Today had been incredible already, but tomorrow was race day. We’d better recharge. Copyright © 2016 Salzmoto, Inc. All Rights Reserved.